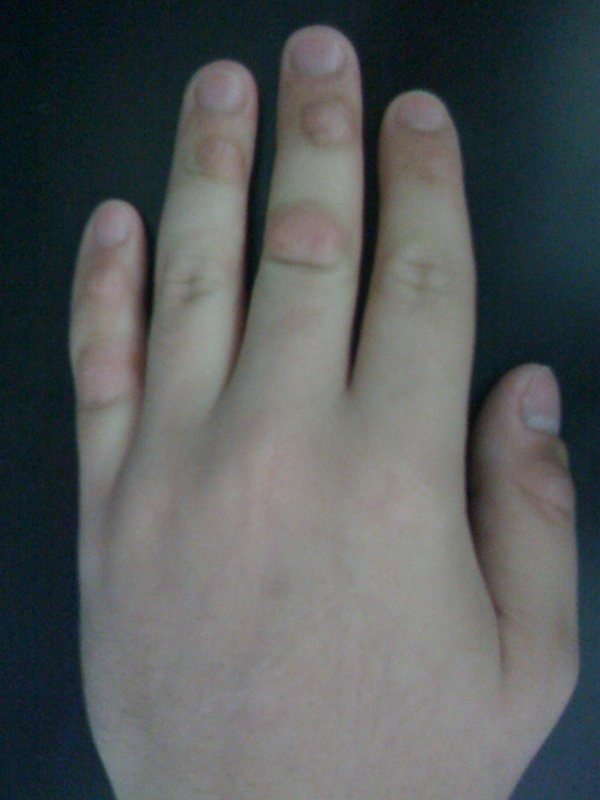 Dermatillomania is a unique disorder that involves picking at the skin. Read and learn all about the causes, symptoms, diagnosis and treatment of this disease. Along with Onychophagia (nail-biting) and Trichotillomania (compulsive hair pulling), Dermatillomania is classified under the category of impulse control disorders referred to as “Body Focused Repetitive Behaviors”. As aforesaid, most cases of this condition are driven by an overpowering compulsion. Patients feel powerless to fight back the urge to pick at their own skin. They generally report of a sense of stress relief and gratification that they can feel while picking skin. Often, the urge is powerful enough to make sufferers damage their own skin to a great extent. Although patients can experience the painful sensation arising from skin-picking, they are unable to stop due to the satisfaction that they get from the activity. The extent and severity of skin damage usually varies from person to person. Picking these skin spots can cause further damage to these regions and even lead to the formation of scars. If patients do not find such spots, they may be forced to create similar surfaces that they can pick. Due to this, this disease is sometimes associated with self-injury or deliberate self-harm. Once patients form a self-created wound or scab over the skin, they continue to pick it. According to sufferers, picking appears to provide them with temporary relief from stress or anxiety. An exact cause of this disorder has not yet been pinpointed. This is mainly because the condition does not have a wide prevalence and only limited research on it has been made. 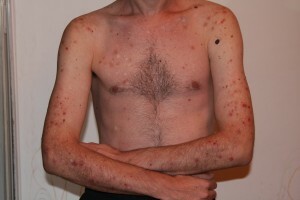 Compulsive picking of skin is usually believed to be triggered by stress and anxiety. Stressful situations are found to compel compulsive skin pickers to a greater extent. The disease has been strongly associated to Obsessive Compulsive Disorder (OCD). Individuals suffering from Dermatillomania, similar to OCD patients, show a same ritualistic behavior and obsession during their skin-picking sessions. Often, during picking-sessions, patients report of entering a state of mind similar to a “trance”. The condition is also often linked with Body Dysmorphic Disorder (BDD). Many people with Dermatillomania are also found to suffer from BDD. BDD is a psychological condition that makes patients have a distorted image about their own body. Individuals suffering from this disease usually get obsessed with some specific flaw in their body, which may be minor or even non-existent. The flaw is highly exaggerated by the sufferer. If the person has an actual scab or lesion, he or she may pick it with the intention of removing it and making the skin seem more normal in appearance. Family members or friends of Dermatillomania patients should take sufferers to medical professionals if they can find the external physical symptoms of this disorder. In some cases, both dermatologists and psychological professionals should be consulted for a proper diagnosis. If dermatological care fails to resolve the problem, patients may have to be taken to a psychological care provider. Most of these disorders can cause skin picking or itching. Due to this, the absence of all these disorders should be confirmed by healthcare providers during the differential diagnosis of Pathologic skin picking (PSP). A lack of understanding can also result in misdiagnosis, with the condition being viewed as a symptom of psychological disorders like Lyme Disease, Chronic Fatigue Syndrome or Multiple Sclerosis (MS). Drug therapy usually involves use of antidepressants or Clomipramine. Selective serotonin reuptake inhibitors are often relied on for treatment of this condition. These drugs are also used for curing depressive symptoms in many people. Such drugs impact the brain in some ways and cause changes in behavior, which help cure this condition. In some cases, medications used to cure OCD symptoms are prescribed to provide patients with relief from this condition. Although drugs are successful in alleviating the symptoms, therapies are usually unsuccessful for permanent relief. Many patients also wish to avoid drug therapies due to the potential side effects or the “doped- effect” produced by the medicines. Despite this, drug therapy is commonly used for treatment of Neurotic excoriation. This therapy focuses on the underlying cause as well as the effect of this condition. It helps the suffering person cope with inner thoughts and look for a non-injurious way to handle the compulsion that forces them to pick their skin. This new approach of dealing with the disease can solve the problem. The treatment has been reported to help many patients of Compulsive Skin Picking. This therapy actually helps patients understand the root cause of their problem. They are made to know what actually compels them to pick their own skin and shown a different method to deal with the problem. This therapy has been found to yield successful results for people suffering from this problem. It is actually a psychological method that deals with realizing destructive behavior and thoughts. It modifies the brain process to cope with the compelling factors in less destructive ways. In many individuals, this therapy is found to be most effective when used along with mood-stabilizing drugs. People observing Dermatillomania patients, such as their friends or family, often feel that it only requires willpower to overcome this problem. However, willpower alone is not enough to overcome a problem that arises from a seemingly unknown cause. Naturally, medical treatment is usually the only possible solution for curing this condition. While the urge to pick is mainly a mental illness, it is sometimes found to decrease with high intake of the B-vitamin known as Inositol. This vitamin is decomposed into two neurotransmitters by the body. These are found to increase the activity of the neurotransmitter known as Serotonin within the brain. This neurotransmitter is believed to be related with Obsessive Compulsive Disorder (OCD). The B-vitamin must be consumed in large amounts to produce effects. This is a water soluble vitamin. Hence, there is no risk of build-up of this B-vitamin to toxic levels. If successfully addressed, the condition can show a good outcome. Until that happens, people suffering from the disease may find “skin-picking” interfering with their daily activities. They can suffer from embarrassment in wearing clothes that expose their skin. They may wear long-sleeved clothes, even during peak summer, and refuse to leave their homes. They may also cover visible injuries on their skin surface with bandages or layers of make-up. Daily activities that involve use of hands, such as typing, can be painful for sufferers who pick their hands. With proper treatment, they can gradually return to normalcy. In children, Compulsive Skin Picking is a rare and sometimes debilitating condition. The disease usually becomes apparent during teenage years or the early stages of adulthood. Recent research, however, suggests that at least one-third of all cases of this disorder arise during pre-school years of the life of a person. The problem is believed to receive a boost from inadequate transmission of signals to the Central Nervous System (CNS) from the brain. This leads to a reduced sensitivity to pain. It is difficult to pinpoint the factors that exactly drive children to pick their own skin. However, the condition is believed to be likelier to arise when a child suffers from stress or boredom. Children typically indulge in skin-picking in class, bathroom, bed or while inside the car. Parents should immediately seek medical care if they come across instances of skin-picking in their children. Trim the fingernails of your child very short. The short length of the nails will discourage a child (prone to compulsive skin picking) to damage his or her skin. Even if this is quite difficult, you should try to keep the fingernails of your kid as clean as possible at all times. This will reduce chances of infection in one or more skin spots that might have been picked. Children are usually more prone to picking when their hands are empty. As aforementioned, stress is also a major possible cause of the development of this habit. Naturally, it makes sense to buy your kid a stress ball to keep his/her hands occupied. If your kid is suffering from a habit of skin picking, do not nag him and draw attention to his habit. This will not reduce the activity. Rather, it will increase his anxiety and make the habit more pronounced. This is an action born out of impulse and unlikely to be in the control of the child. Try to help your child perform activities that reduce his stress levels. Increased stress causes greater anxiety and leads to increased picking. Dermatillomania is not associated directly with acne in adults. However, the condition may give rise to acne problems due to implanting and spreading of oils, dirt and germs. Most individuals with or without acne have a habit of picking at their skin. While picking is not advisable, mild scratching does not cause much harm. However, it can make acne lesions heal at a slower pace. There is not much scientific evidence to establish this as a hereditary condition. However, some researchers suggest that this is genetic in origin. According to many researchers, the gene associated with the origin of OCD is also present in individuals suffering from this disorder. There is also some evidence that the condition has genetic association with Trichotillomania. Lip Picking is another problem that is closely associated with this condition. It not only involves picking the skin over the lips but also chewing or biting the inner side of the cheek. The problem often arises after the lip has been overexposed to extreme weather conditions, such as high heat, wind or cold. This leads to dryness of the lips and the mouth, causing development of flakes that easily peel off. Most people allow their body to heal naturally. However, some people pull or pick at the damaged skin and cause it to peel off. Lip picking is regarded as a type of OCD behavior that often arises from extreme stress and anxiety. Although skin picking is observed in both males and females, it is most commonly noticed in women. Typically, the problem arises during the teenage years. In most women, the problem usually develops as a conscious habit to handle tension. In course of time, however, it becomes an unconscious habit and transforms into an impulse-control disorder. Go over these useful Dermatillomania photos to know about the physical appearance of skin regions that have been picked. You my use these images of Dermatillomania for reference. If you have anyone in your family or know someone who is suffering from this disorder, seek immediate professional treatment. The presence of Dermatillomania usually indicates a potential physical or mental health problem. Naturally, treatment from a licensed health care provider is extremely necessary to cure this problem. Proper evaluation and treatment can help sufferers gradually return to normalcy and lead a normal lifestyle.